BYS: Live On Earth USA: Support projects in LA, SF, DC and NY! Live On Earth USA: Support projects in LA, SF, DC and NY! So since our staffs is attending every Live On Earth USA concerts, we thought of organizing little cheer projects. The projects will be slightly different for every location. Mnet has agreed with those projects. "Guess who's back, TS baby" followed by "Saranghaeyo B.A.P" Since it's their second time in LA, we should welcome them back! To be in synchronization, we should shout the cheer AS SOON AS they finish their greetings. Please consult this PAGE for all the infos about the DC concert, organized by our Admin Chanmol and Translator Danti! *** LIGHT STICK AND SALUTE PROJECTS FLYERS: Due to money issues we are unable to print out the flyers! So if anyone can help print out 4 or 5 copies of the new flyers and help pass it out at the day of the concert or give it to us at the fanbooth at the fan meet (bapyessir.com) Thank you very much! Click here for the document! We will bring a big banner to the concert venue, and will give it to few people that have tickets from selected area. The flag will be white and will read "AMERICA IS NOW CONQUERED" in both Korean and English. Fans will be able to sign the banner if they want and the banner will be delivered to the members. Since NY is their last stop, we wanted to thank them for coming to USA and show them that they succeed in their mission. We will raise the flag at the end of the concert. We'll give more specific infos to the people who will participate in the project. (We'll 3-4 people to raise the flag since it will be pretty big). 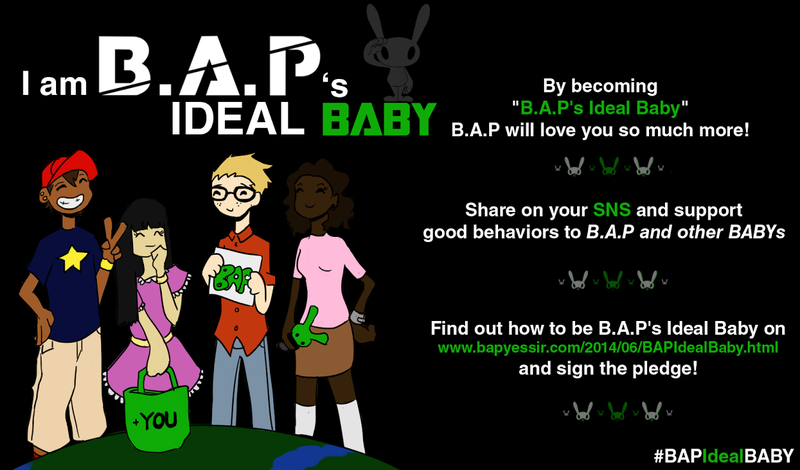 Please spread the word and help this welcoming project for B.A.P come to be. Thank you! I'm an admin of BAP Canada. I'm going to the NYC concert. If there's anything I can do or help out with, let me know. I'd love to collab with you !! My twitter is @/lastxfantasy ! Thanks! We'll need funds for the banner, so we might contact you soon! When you mean the end, do you mean the last song? I was thinking for the NY stop, that for the last song everyone in the audience can hold up a "Thank You" paper just a way to say thanks to them. And I think it would be great to do that together with the banner project you guys have, what do you guys think? Yeah that's a good idea! We need to hurry and spread the word! OMG i want to participate in the NYC flag event!! Should we be there a lot earlier than the concert though to help? I live in NYC and was going to make it to the venue early anyway.